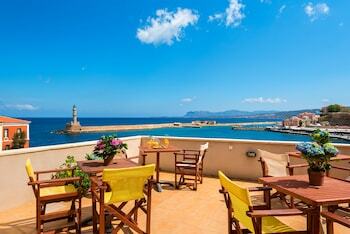 With a stay at Amphora Hotel, you'll be centrally located in Chania, steps from Chania Lighthouse and 7 minutes by foot from Venetian Port. Featured amenities include a computer station, multilingual staff, and luggage storage. Located in Kos (Marmari), Blue Jay Beach Hotel is close to Tigaki Beach and Lido Waterpark. The front desk is staffed during limited hours. Free self parking is available onsite. Located in Malia, Theoni Apartments is a 5-minute drive from Palace of Malia and 6 minutes from Stalis Beach. The front desk is staffed during limited hours. With a stay at Thimonies Villas in Rethymnon, you'll be within a 15-minute drive of Military Museum and Town Beach. Free self parking is available onsite.